4th of July message from Mary Ann The entire +Heiser Automotive Group wishes your family a fun-filled and safe holiday. The 4th of July is a great day to celebrate with the community and honor that Anything’s Possible spirit our country represents. I’m particularly proud of our staff at the Heiser dealerships and have extended the Friday holiday off to both sales and service personnel. My hope is you will take the time to relax and mark the midway point in our summer. If Heiser can help with your vehicle needs in any way, our sales department will be open from 9 a.m.-5 p.m. on Saturday the 5th. Service departments remain closed until the Monday following the holiday. 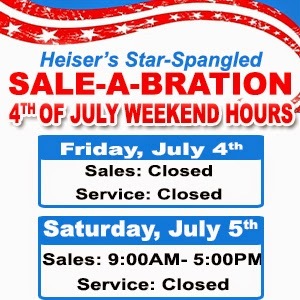 A visit to heiser.com can provide additional information on our plan for a Star-Spangled Sale-a-Bration! Check it out.